Andropogon citriodorus Desf. nom. inval. 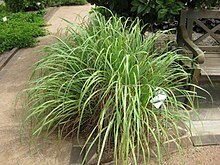 Andropogon roxburghii Nees ex Steud. Cymbopogon citratus, commonly known as lemon grass, is a tropical plant native to South Asia and introduced to many tropical regions. Cymbopogon citratus is often sold in stem form. While it can be grown in warmer temperate regions, such as the UK, it is not hardy to frost. Cymbopogon citratus is abundant in the Philippines and Indonesia where it is known as tanglad or sereh. Its fragrant leaves are traditionally used in cooking, particularly for lechon and roasted chicken. The dried leaves can also be brewed into a tea, either alone or as a flavoring in other teas, imparting a flavor reminiscent of lemon juice but with a mild sweetness without significant sourness or tartness. The leaves of Cymbopogon citratus have been used in traditional medicine and are often found in herbal supplements and teas. In the folk medicine of Brazil, it is believed to have anxiolytic, hypnotic, and anticonvulsant properties. In traditional medicine of India the leaves of the plant are used as stimulant, sudorific, antiperiodic, and anticatarrhal, while the essential oil is used as carminative, depressant, analgesic, antipyretic, antibacterial, and antifungal agent. Laboratory studies have shown cytoprotective, antioxidant, and anti-inflammatory properties in vitro, as well as antifungal properties (though Cymbopogon martinii was found to be more effective in that study). Citronellol is an essential oil constituent from Cymbopogon citratus, Cymbopogon winterianus, and Lippia alba. Citronellol has been shown to lower blood pressure in rats by a direct effect on the vascular smooth muscle leading to vasodilation. In a small, randomized, controlled trial, an infusion made from C. citratus was used as an inexpensive remedy for the treatment of oral thrush in HIV/AIDS patients. Lemon grass oil contains 65-85% citral in addition to myrcene, citronella, citronellol, and geraniol. Hydrosteam distillation, condensation, and cooling can be used to separate the oil from the water. The hydrosol, as a by-product of the distillation process, is used for the production of skin care products such as lotions, creams, and facial cleansers. The main ingredients in these products are lemon grass oil and "negros oil" (mixture of lemon grass oil with virgin coconut oil) used in aromatherapy. One low-dose study found no effect of Cymbopogon citratus essential oils on humans. However, subsequent research has demonstrated that the plant's essential oil enhances GABA-ergic neurotranssmision at sufficient doses (with an anxiolytic threshold dose of 10 mg/kg) via positive allosteric agonism in the same manner as benzodiazepines (ex. diazepam) which are used clinically as anxiolytics, sedative/hypnotics, muscle relaxants, and anticonvulsants. Despite the observed pharmacological activity, the average adult male would require 600–800 mg of the pure essential oil to achieve a clinically significant reduction in anxiety. Most commercial supplements contain doses far below the threshold dose which suggests that the majority of lemongrass supplements exert their anxiolytic benefits either primarily or entirely through the induction of the placebo effect. As the essential oil was demonstrated to act synergistically with other GABA-ergics (even in sub-therapeutic doses) and likely also potentiates anxiolytics of other mechanisms (as predicted by the mechanics of benzodiazepines), the possibility of pharmacologically-induced anxiolysis cannot be eliminated when formulations containing a sub-therapeutic lemongrass dosage also contain other anxiolytic herbs/chemicals. Beekeepers sometimes use lemon grass oil in swarm traps to attract swarms. Lemon grass oil has also been tested for its ability to repel the pestilent stable fly, which bite domestic animals. ^ "Cymbopogon citratus". Germplasm Resources Information Network (GRIN). Agricultural Research Service (ARS), United States Department of Agriculture (USDA). Retrieved 2008-03-02. ^ "The Plant List: A Working List of All Plant Species". Retrieved May 8, 2014. ^ "Cymbopogon citratus". Natural Resources Conservation Service PLANTS Database. USDA. Retrieved January 12, 2019. ^ "Cymbopogon citratus". Plants of the World Online. Royal Botanic Gardens, Kew. Retrieved March 4, 2019. ^ "Tanglad / Lemongrass". Market Manila. August 21, 2006. Retrieved July 27, 2011. ^ Blanco MM, Costa CA, Freire AO, Santos JG, Costa M (March 2009). "Neurobehavioral effect of essential oil of Cymbopogon citratus in mice". Phytomedicine. 16 (2–3): 265–70. doi:10.1016/j.phymed.2007.04.007. PMID 17561386. ^ Figueirinha A. Cruz MT. Francisco V. Lopes MC. Batista MT. (2010). "Anti-inflammatory activity of Cymbopogon citratus leaf infusion in lipopolysaccharide-stimulated dendritic cells: contribution of the polyphenols". Journal of Medicinal Food. 13 (3): 681–690. doi:10.1089/jmf.2009.0115. PMID 20438326. ^ Lee HJ. Jeong HS. Kim DJ. Noh YH. Yuk DY. Hong JT. (2008). "Inhibitory effect of citral on NO production by suppression of iNOS expression and NF-kappa B activation in RAW264.7 cells". Archives of Pharmacal Research. 31 (3): 342–349. doi:10.1007/s12272-001-1162-0. PMID 18409048. ^ Sunita Bansod; Mahendra Rai (2008). "Antifungal Activity of Essential Oils from Indian Medicinal Plants Against Human Pathogenic Aspergillus fumigatus and A. niger" (PDF). World Journal of Medical Sciences. 48 (10): 81–88. doi:10.1016/j.fct.2010.07.027. PMID 20655974. Retrieved November 4, 2012. ^ Bastos JF. Moreira IJ. Ribeiro TP. Medeiros IA. Antoniolli AR. De Sousa DP. Santos MR. (2010). "Hypotensive and vasorelaxant effects of citronellol, a monoterpene alcohol, in rats". Basic & Clinical Pharmacology & Toxicology. 106 (4): 331–337. doi:10.1111/j.1742-7843.2009.00492.x. PMID 20002067. ^ Wright SC. Maree JE. Sibanyoni M. (2009). "Treatment of oral thrush in HIV/AIDS patients with lemon juice and lemon grass (Cymbopogon citratus) and gentian violet". Phytomedicine. 16 (2–3): 118–124. doi:10.1016/j.phymed.2008.07.015. PMID 19109001. ^ Baby P. Skaria; P.P. Joy; Samuel Mathew; Gracy Mathew; Ancy Joseph; Ragina Joseph (2007). Aromatic Plants. 1. New Delhi, India: New India Publishing Agency. p. 103. ISBN 9788189422455. ^ Leite JR, Seabra Mde L, Maluf E, et al. (July 1986). "Pharmacology of lemongrass (Cymbopogon citratus Stapf). III. Assessment of eventual toxic, hypnotic and anxiolytic effects on humans". J Ethnopharmacol. 17 (1): 75–83. doi:10.1016/0378-8741(86)90074-7. PMID 2429120. ^ Costa CA, Kohn DO, de Lima VM, Gargano AC, Flório JC, Costa M (1 Sep 2011). "The GABAergic system contributes to the anxiolytic-like effect of essential oil from Cymbopogon citratus (lemongrass)". Journal of Ethnopharmacology. 137 (1): 828–36. doi:10.1016/j.jep.2011.07.003. PMID 21767622. ^ a b Baldacchino, Frédéric; Tramut, Coline; Salem, Ali; Liénard, Emmanuel; Delétré, Emilie; Franc, Michel; Martin, Thibaud; Duvallet, Gérard; Jay-Robert, Pierre (2013). "The repellency of lemongrass oil against stable flies, tested using video tracking". Parasite. 20: 21. doi:10.1051/parasite/2013021. ISSN 1776-1042. PMC 3718533. PMID 23759542. This page was last edited on 4 March 2019, at 08:41 (UTC).